Classic British chocolate teatime biscuits, with a traditional chocolate cream filling and two bonus fillings – whipped peanut butter, and matcha green tea with vanilla. These crisp, dark chocolate wafers are the perfect companion for a cup of tea or your preferred alternative. Call it winter blues, call it having a massive sweet tooth, or call it being homesick for my mother country’s dessert items, but over the last few weeks I’ve had a big old hankering for biscuits. Brits (and Commonwealth-based readers) will know exactly what I’m talking about, but just to make the point clear: I don’t mean American-style “biscuits”, the savory (sometimes cheesy) risen doughy product with a soft interior that you might slather with butter and eat for brunch. Neither are they exactly “cookies”, in the strictest sense. A small, lightly sweetened, unrisen baked item, that will break with a snap (it should definitely not bend), and is typically eaten as a light snack with a drink (tea, coffee, milk). Some are a single layer (digestive or Rich Tea), and some comprise two layers sandwiched with a thin cream filling (custard creams, Bourbons). If it helps you to think of them as “tea biscuits” or even “sweet crackers”, feel free. Of course, living in Britain, few people would go to the trouble of making a variety of a store-bought biscuit, since it’s a matter of minutes to pop into the nearest shop and pick some up. Here in the US, though, we’re just going to have to roll up our sleeves and do it ourselves. And we’re going to start with the classic sandwich chocolate biscuit, the Bourbon. Let’s get this out of the way at the outset: there’s no actual bourbon whisky in bourbon biscuits. Now, that may be a deal breaker for you; I know it was a big disappointment for Emily. The name refers to the royal house of Bourbon, a line of noble ancestry that produced monarchs in both France and Spain from the 16th century onwards. If it makes you feel better, Bourbon County in Kentucky (as well as the actual spirit, of course), are also named after the royal Bourbons, so, you know, Americans got the boozier end of that deal. 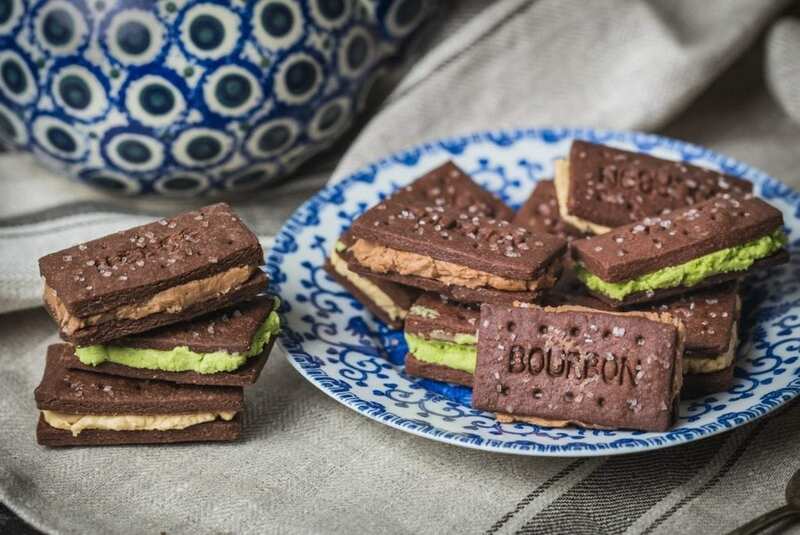 The Bourbon, in biscuit form, was created in England by Peek Freans in 1910, and, since falling out of whatever copyright system biscuits may use, is now pretty much made by everyone. There’s pretty good conformity between the versions, though, which means that with a little care and an optional letter stamp, you can create a biscuit with fantastic fresh home-made flavor that’ll actually be so much tastier than the store-bought kind. 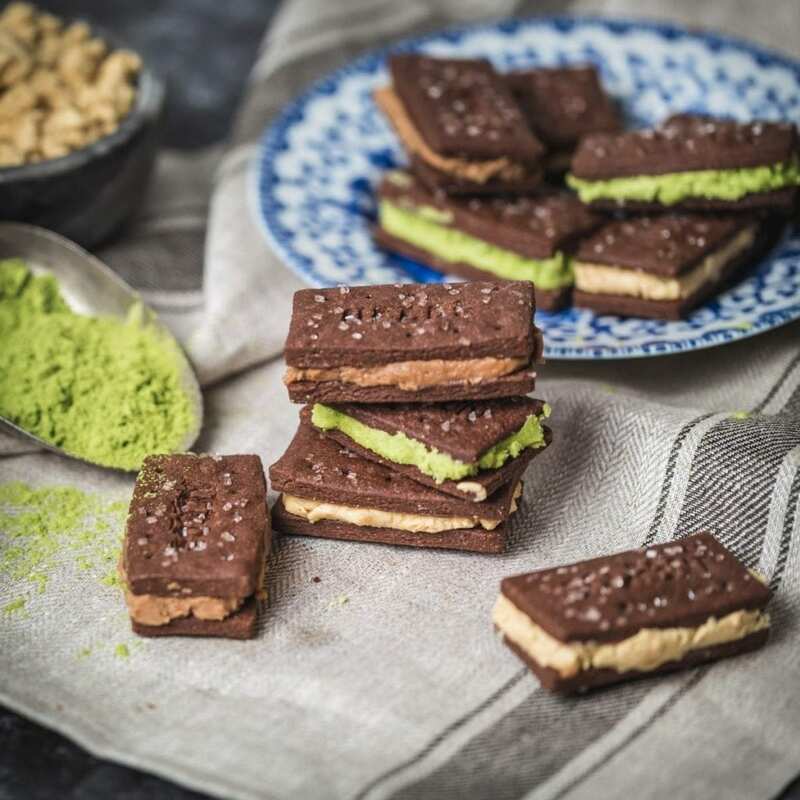 We adhere as closely as possible to the original biscuit size, shape, texture and flavor, but have a bit of fun with the fillings: our picks this round are chocolate, peanut butter and matcha green tea. Biscuit dough has very little liquid content, and is pretty stiff. It may take a little elbow grease to get it rolled. Don’t worry about getting the dough perfect in one go: roll out enough to let you cut as many biscuits as you can, then re-combine the remaining bits and repeat as necessary. This recipe is based on an original by Sophie Grigson, but I found that her buttercream was rather too thin – perfect for cupcakes, but in a sandwich biscuit you need to be able to snap it without fearing it will splurt all over your lap. The store versions have to be shelf-stable, with the ability to stay as fresh as possible even after you’ve opened the bag, so they generally use palm oil, which is solid at room temperature. Since this is not an ingredient that most people have ready access to, and since quite frankly we like the taste of butter, that’s what we’re going to use, with the caveat that the buttercream will become soft at high temperatures, and the biscuits should be kept in a sealed container, refrigerated for maximum storage (about 3 days is probably as good as you can hope for). However, you can play with the texture of the cream, adding more confectioner’s sugar for a stiffer texture. The ratios of butter to sugar we’ve used in the three recipes below are what we’ve found works best for this purpose (a cake buttercream will have a higher proportion of butter). Most buttercreams will be pretty solid right out of the fridge, of course, so if you plan to serve them chilled, you might be able to get away with more butter. I follow Sophie’s recipe for the dough pretty closely, though, with one affectation as a nod to the traditional biscuit, which I’ll come to later. So the flour, corn starch and cocoa are sifted together, and salt mixed in (I only don’t sift the salt because the Kosher variety is too coarse for my colander!). The butter and superfine sugar are blended together in a food mixer, and then the flour is mixed in. It’ll be pretty stiff while dry, but you only need a little milk to loosen it enough to form a stiff but pressable dough. Next is the rolling stage, and we’re looking to get the dough to 1/8″ thickness. There are various ways to do this, and you may already have your favorite – you can, for example, buy specifically-sized silicone rings that wrap round a rolling pin, or a roller that has slightly raised ends – but our cheap-n-cheerful method is to use two wooden skewers (which are almost exactly 1/8″ thick) each side of the dough, which the rolling pin rests on to control the height of the dough. The process shots should give you the general idea. But honestly, if you have a better process, please write in the comments and let us know, because I need all the help I can get. Life’s easier with a dinky cutter/stamp. Once the dough is rolled out thin, it’s time to cut or press it. I handcut my first batch by measuring, with a kitchen ruler, 60mm (roughly 2 inches) across and 30mm (1 inch) down each row. For that batch, I also obtained a craft/baking letterpress set which you can customize into whatever wording you like. I stamped “NERDS” on one side of the sandwich and “KNIVES” on the other. It’s quite fun to personalize the biscuits in this way, but I did find that the quality of the letters wasn’t quite as nice as I’d have liked. To make the steam holes across the top and bottom of each piece, I used the same wooden skewers that I’d used to measure the height of the rolled dough. Do NOT forget the sprinkling sugar. Once the individual biscuits are stamped and shaped, we arranged them on a baking tray lined with a silicon mat. For the last step, as a nod to tradition, I took a little sprinkling sugar – crystals which don’t melt in baking – and tossed it over the biscuits. You may want to press gently into the dough to make sure it sticks, but try not to deform the shapes. Finally, chill for half an hour in the fridge before baking at 350F for 12-15 minutes. Cool fully on a wire rack. While the biscuits are baking, or afterwards, you can work on the buttercream. We’ve put together three separate variations which are identical except for the main flavoring/colorant: melted chocolate, peanut butter, and matcha green tea powder. First, cream together the butter and sugar, and then mix in whichever flavoring you’re using. For the matcha, we recommend dissolving it first in a little milk to make it easier to combine. You can apply the filling to the biscuits as soon as they’re cooled. You won’t need very much for each sandwich, about a shy tablespoon is plenty – we went a little rustic, as you can tell from the pictures, but if you want something that’s more like a store-bought replica, you can be a little more precise. Eat right away, or refrigerate and serve within 3 days as part of an afternoon tea selection, or just if you’re feeling particularly British and want something sweet with a cuppa. Voila: rustic versions of the Bourbon. Teapot not included. Line two baking sheets with parchment paper or a silicon mat. Sift the flour, corn starch, and cocoa together. Mix in the salt. Cream the butter and sugar together in a food mixer for 2 minutes until fluffy. Add just enough milk to form a stiff dough ball. Roll the dough to ⅛" and cut or stamp into rectangles 60mm x 30mm or 2" x 1". Stamp if you like, or if not just prick holes across the biscuit with a skewer or fork. Add sprinkling sugar, if using. Chill biscuits for 30m in fridge, then bake for 12-15m. Once baked, cool on a wire rack. Cream the butter in a food mixer until fluffy, and then gradually mix in the confectioner's sugar. If making the chocolate version, heat chocolate in a bowl over a hot water bath until just melted, then cool to room temperature. Add to the butter and sugar and mix until combined. If making the peanut butter variation, add the peanut butter into the butter and sugar. If making the matcha version, dissolve the matcha powder in the milk, then add to the other ingredients. Sandwich two biscuits together with a little of the filling, and store refrigerated until ready to serve. Biscuits should keep for 3-4 days.